See what's in what Tilray sells. Elon Musk isn't the only one getting high lately. Tilray Inc. (TLRY , the legal-marijuana company, is up some 800% since its IPO at $17 in July. The products in the world of marijuana can be confusing. There's CBD, THC, different blends and different forms in which to take them. Investors can be forgiven for feeling they are deep in the weeds trying to understand the product base. 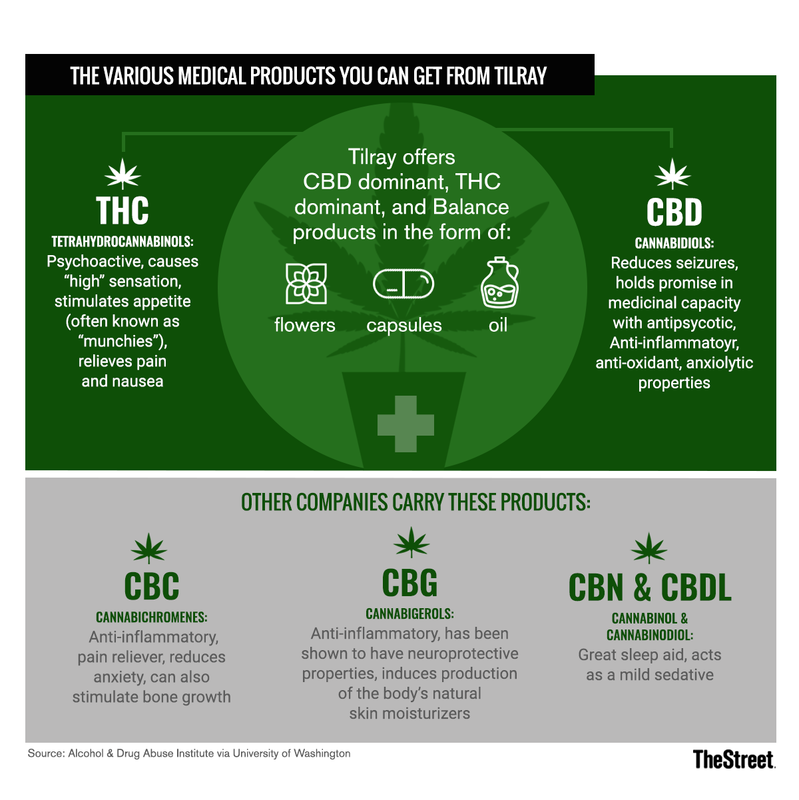 Tilray offers marijuana in the form of ingestible oil and dried flower. The oil drops come in a small bottle, with a price range of $44 to $108. Here's a rundown of its products. This can be taken in the form of oil, capsule or dried flower. The CBD dominant oil products have a range of 22.7 milligrams to 25.1 milligrams of CBD, and a range of 1 to 5.7 milligrams of THC per dose. The capsule product has 17.7 milligrams of CBD and 4.7 milligrams of THC. There is no CBD dominant flower product. This can be taken in the form of oil and flower, but not capsule. The THC dominant oil product has 23.3 milligrams of THC and .1 milligrams of CBD. The flower forms have a range of 15.3% THC to 26.3%, and all have 0.1% CBD. These products have a more equal weighting of CBD and THC in them. The oil form has 10.4 milligrams of THC and 10 milligrams of CBD. The capsule form has 9.5 milligrams of THC and 10.7 milligrams of CBD. The flower form has 12.2 THC and 12.9% CBD.